MIRAMICHI– Opening Day is virtually upon us and the desire to get back on the river is running high. However, Sunday’s opening could present a few problems. It is no secret that the ice has long gone from the rivers, but the shores are another thing. In fact, getting to the water could be a problem for both shore anglers and those who plan on fishing from a boat. Combined with this is the low water for the time of year which can also making boating a hit or miss situation, maybe even literally. 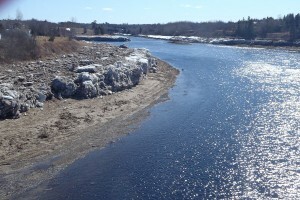 Taking a look at Quarryville on the Main Southwest Miramichi, anglers will have a problem getting their boats to water. Shore anglers may also have a problem as the ice-run several weeks ago has left a sheer cliff of ice along both banks above and below the bridge. George Routledge said there were “piles of ice on both sides six to 10 feet in height. Anglers will have to clear a spot to get their boats through, so they may need an axes and shovels”. One possible spot is below the bridge where the ice took out three hydro poles. 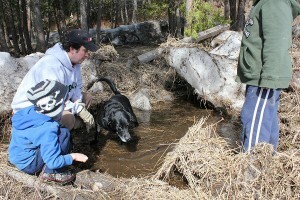 To repair them, the hydro had to clear a path almost to the river. George said that a good number of camps in the area suffered damage. The shore anglers will also find it is no easy task getting to the river. There is ample space between the ice and the water for angling, but just getting there may be a bit challenging. George also noted that the water level is summer low with the island out. He stressed, not June low, but even later. To put a boat into the Renous one would have to wade with it to the middle and float in down as there would probably not be enough water to run it. Flies of choice would include Black Ghosts, Blue Smelt, Golden Eagle, Renous Special and “Maybe even a Black Ghost or Green Machines on a no. 2 hook” said George. Further up river the Main Southwest in Blackville, Herb Barry Sr. of Herb’s Fly Shop on the Station Road said the water there had been low. A few who had boats out last week before the storm were having trouble with some of the river bars. The water had come up some, but was still very low for the time of year. If it gets any lower, running a boat could be a real challenge. He noted that in terms of shore ice, some places were clogged while others were wide open. He said there seemed to be fish around. Flies of choice were Herb’s Silver Smelt, Herb’s Gold Smelt as well as the Christmas Tree and Renous Special. Moving to the Doaktown area, Derek Munn of Ledges Inn said the water was a very low for the time of year, and running a boat could be tricky. He planned to take his sports out in 26-foot canoes. The shores were a mixed blessing with some having eight feet of ice, while others were clear. Flies of Choice were Maribous, Christmas Trees, Renous Specials, Black Ghosts, Golden Eagles and Mickey Finns. Moving to the Northwest Miramichi, Syd Matchett of Trout Brook Fly Shop said the water in the river was very low “and even the brooks are low”. “It is going to be difficult to run a boat other tan in the tide-water”, said Syd. 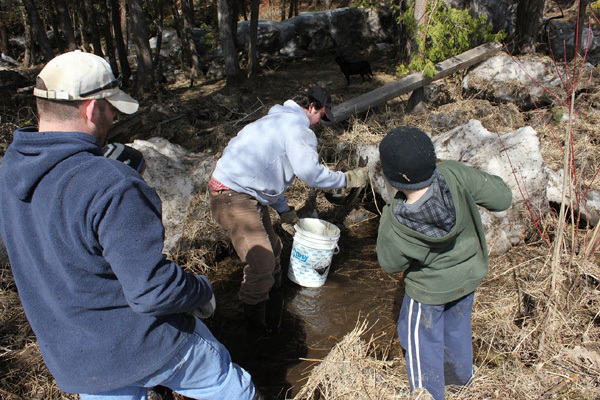 He said that around Wayerton area, shore anglers should have little problem getting to the river, but the lower parts of the river have more shore ice. Flies of Choice are Golden Eagles, Black Ghosts, Mickey Finns and Renous Specials. Brett Silliker of Upper Oxbow Outdoor Adventures on the Little Southwest Miramichi said that getting a boat down to the Northwest could be tricky, and even with high tide, coming back would be a real challenge. So, he was advising caution. Flies of Choice were Renous Specials, Black Ghosts, Golden Eagles and Smelt patterns. Congratulations are in order for John Hawkes and Betty Ward and their volunteers for taking a great first step in organizing the first fly-fishing forum in Eel Ground a week or two ago. It was nice to see the older tyers instructing the up and coming tyers! So be careful and enjoy Opening Day as you get out and “on the water“. Close to 100 people attended an information meeting at the Beaverbrook Kin Center in Newcastle Tuesday evening. 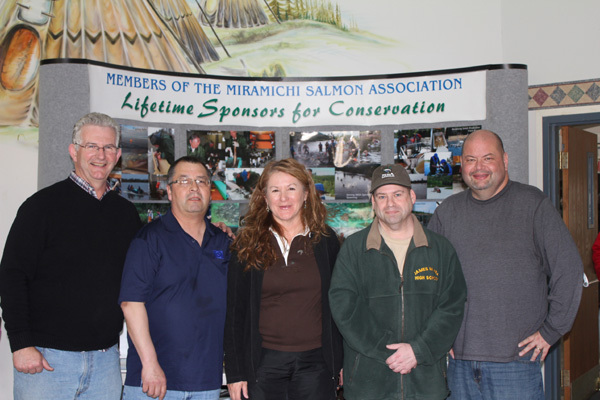 MSA’s Biologist Jenny Reid, with help from Hatchery Manager Mark Hambrook, gave an update on salmon projects and statistics for the past several years. DFO then informed the group that the rules & regulations imposed last year will continue this season in terms of salmon with a large portion of the Northwest Miramichi closed to retention above Wayerton Bridge and on the Sevogle starting June 1, 2012. As well, there is no change in the bass situation. As it stands, there is no angling season for Striped Bass on the Miramichi. Many present expressed their frustration at the large numbers of bass in the system, and wanted an angling season. I wanted to send you a couple of pics, and share a story from this past weekend. We have a piece of property just up from the Quarryville pool on the Main Southwest. As you know the warm weather several weeks ago sped the ice out, and left an unbelievable amount of ice down river. Our property was no exception, and the massive chunks of ice flowed over the berm into the woods…it was quite an event when discovered by my brother in law, Mark English. We spent the day over Easter exploring the ice, and unbelievably, my 7 year old son Daniel spotted a grilse, trapped in a pool (or rather a large puddle), a good 50 meters from the river. He must have come in when the water rose, and the ice trapped him as the river receded. To make a long story short, my good buddy Nathan Jones was able to tail him, and we transported him back to the river in a large bucket. We successfully released him back into the river. For a fish that was landlocked in a puddle for likely three weeks, he swam away with more energy than we hoped. It was certainly a memorable catch and release story for everyone, especially my son Daniel, who loves to fish. Present: Daniel Jackman (7), Max Jackman (6), Margaret Jackman, Mark English, Nathan Jones, Ryan Jackman and Morgan the dog! ASF’s Annual Toronto Dinner is right around the corner and we are excited that our guest speaker will be Deirdre Brennan, Producer of “Atlantic Salmon -Lost at Sea” . Deirdre will share stories about the people she has met through her filming – people who are passionate about protecting our planet. This year’s live auction will once again be quite a show with the energetic style of auctioneer Rock Fournier. The auction catalogue is now available on the ASF Special Events Page and the line up includes some pretty special items including; A trip to Fork’s Camp on the Moisie and to the Nicholas Dean Lodge as well as original art, other hard to come by fishing trips and some really unique non fishing items. Have a Look! This is a syndicated post. You can view the original post here: Miramichi Fishing Report for April 13, 2012.